Tomorrow is the final issue of The Superior Foes of Spider-Man. It’s a title that didn’t receive nearly as much attention as it deserved, but one that we at ComicBook.Com loved dearly. I mean, we loved this title a lot and I mean a lot. Steve Lieber and Nick Spencer crafted one of the funniest comic series to grace spinner racks in years. They managed to infuse Spider-Man’s backyard with comedy and caper elements and make their readership really care about some of the lamest looking D-listers in the Marvel Universe. 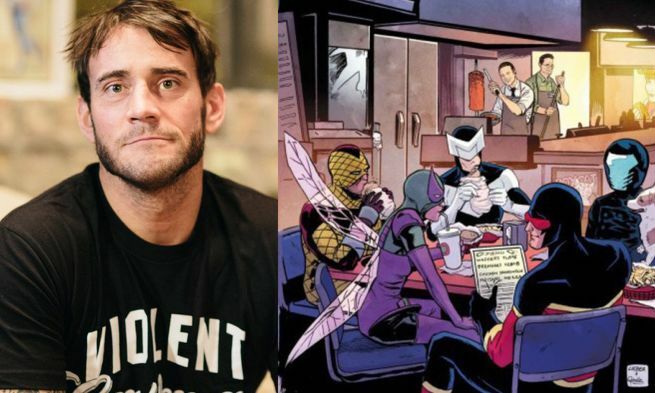 Superior Foes of Spider-Man #17 ends with a special surprise though, a letter from a famous fan who goes by the name of CM Punk to help kick this comic out the door. Sure, CM Punk is a famous wrestler and a brand new comic book writer preparing to make a splash with artist Rob Guillory on Thor Annual #1, but that’s not the reason he’s a perfect fit for this final letters page. Celebrities are great and all, but just because they have millions of adoring and devoted fans doesn’t mean they deserve to have the final word on one of Marvel’s best ongoing series. CM Punk isn’t great because he’s famous, it’s because he is exactly the kind of person his name describes. He’s a total punk. CM Punk is all wisecracks and braggadocio in his letter. 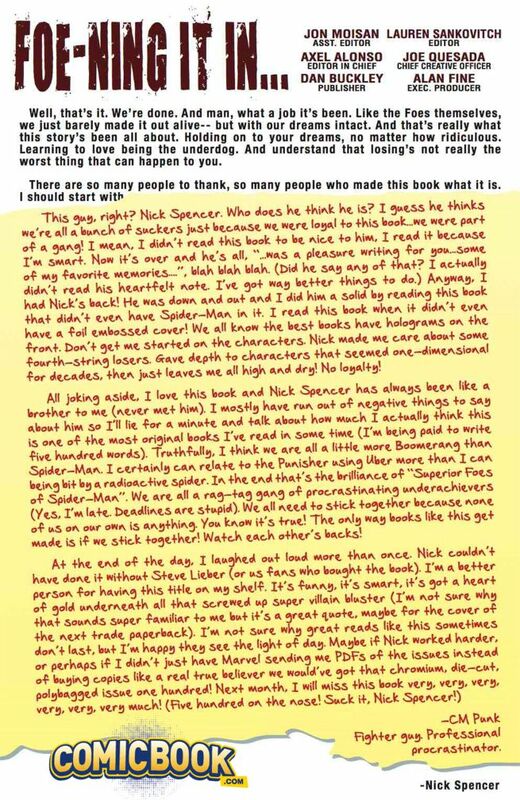 Every time he talks up the work done by Lieber and Spencer on this series, he takes the next opportunity to knock them down a peg. Jumping on the beginning of Spencer’s sincere farewell, he refuses to provide more than an iota of seriousness. Instead, it’s all jokes (some bad and some good) and backhanded compliments. It sounds exactly like what you would expect from an issue of Superior Foes. CM Punk is the boomerang of letter writing here. This letter doesn’t feel like a celebrity jumping in at the last second; it feels like a true fan of Superior Foes sending it off in the manner it deserves. If you love this comic, then you appreciate the underdog humor, the incredible ego, and boisterous wisecracking. When I was writing a piece about Lieber’s contributions to the series a while back I made a joke about all twelve of the people who read the series loved it. My editor asked me if I was being mean. Not at all. You poke fun of something like Superior Foes because you love it and you know that it’s in line with the tone and attitude of this brilliant comic. So here it is: the final page, the curtain call, the last hurrah. This is the epitaph on the grave of The Superior Foes of Spider-Man. And we can be grateful that CM Punk is here to give us a little bit of wisdom and remind us why we should consider ourselves lucky to have even had this series in the first place.